I've written about how I am not overly fond of police. In my experience and those of many people I know, police are overly aggressive with citizens, especially black people, and most especially with black males of any age. Police actions cause fear, contempt, and hatred. I think that police too often reflexively choose the harshest penalties when interacting with black people: unnecessary searches, use of force, citations and tickets when a similarly situated white person gets assistance or maybe a warning, etc. But I'm also irritated at people (usually teens) walking in the middle of the street. The sidewalk is for walking. The street is for driving. I don't drive on the sidewalk and get upset when someone checks me. Before watching the video below the jump I was primed to blast the cops but afterwards I couldn't-at least not completely. The police officer could have stayed in his car, but police also could ignore a highway speeder who has slowed down. Often they do. But sometimes they don't. If I'm the cop in that situation once I have told the teens to get out of the street and they've done so I'm going to keep moving. My ego isn't so weak that I need to frighten kids with my "authority". But enforcing a reasonable law is not a crime. Unless you are ready to hold court in the street and kill or die, you won't win confrontations with police. If the police order is legal, most people will eventually comply with it, willingly or not. When the police act criminally, then I believe that we have the right to refuse the illegal order and defend ourselves. But that's not what the below video shows. Few cops will let a citizen ignore them and walk away from a legal detention. FWIW, I'm not sure of the race of the teens. I've seen separate descriptions of them as Latino and/or Black. People who know teenagers will be familiar with the surly responses, sarcastic repetition of questions, and avoidance of compliance. It's what teens do. But sometimes, whether facing parents or cops, it's wise to stay quiet and comply with lawful orders. The primary goal during police interactions is to survive and go home. The police don't care about your feelings. They are uninterested in debates. Knowing when to fight is just as important as fighting. More so, actually. 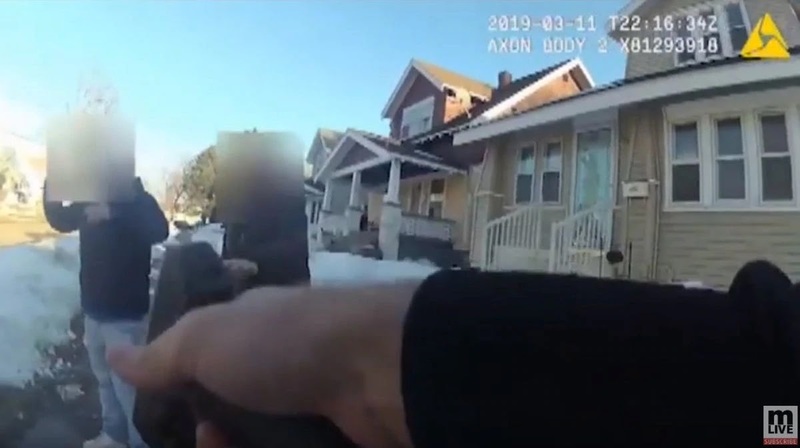 When the officer attempted to arrest the 15- and 16-year-old males, the encounter escalated and resulted in the officer pulling out and pointing his gun at the two teens and ordering them to the ground to be handcuffed. One of the teens was transported to juvenile detention for resisting and obstructing a police officer. The other was transported home by police. People have wondered if police would have arrested a blonde white woman in a similar situation. Well they have actually. Okay Vera Pecaj wasn't blonde but she was white. And she was arrested during a confrontation with a police officer of another Michigan municipality. Pecaj was out jogging when a police officer told her she needed to run on the sidewalk. Pecaj declined to do that. She declined to give her name. She decided to resist arrest and tell the cops all about themselves. It didn't end well for her.